Sun: Apr. 3 – Unveiling of a new marker at the site of Richmond's African Burial Ground – April 3 is the anniversary of the day in 1865 when Union troops led by Black cavalry and infantry liberated Richmond from Confederate rule. 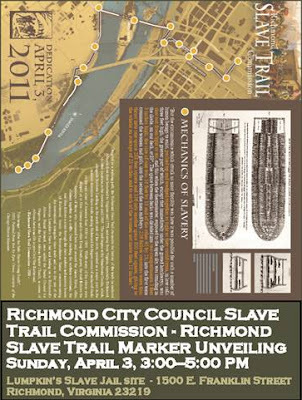 On this day, Richmond's Slave Trail Commission will unveil 17 markers noting important historical sites along the Trail of Enslaved Africans. One of these markers will describe the site of Richmond's African Burial Ground, which – due to a more-than-10-year community campaign – is being liberated from its present status as a VCU-owned parking lot and turned over to the City of Richmond for proper memorialization. This has been a long and difficult struggle against some of the most powerful forces in Richmond. Come out to celebrate this major milestone in the struggle to reclaim the Burial Ground while we rededicate ourselves to staying involved until this sacred ground is properly memorialized. 3 pm, site of Richmond's African Burial Ground, 15th and East Broad streets, six blocks east of City Hall.